The 2851191 LEGO Star Wars Obi-Wan Kenobi Watch is a light blue, light gray, and black watch, depicting Obi-Wan Kenobi on the face. It was released sometime in 2009. This is a description taken from LEGO.com. Please do not modify it. (visit this item's product page) The Force is with your watch! 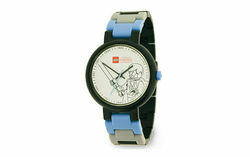 Build your own LEGO® Star Wars™ watch! Start with the white face, then add blue and gray links to build the watch band in any pattern you like. Includes an illustrated image of a LEGO Star Wars Obi-Wan Kenobi™ minifigure on the face. Watch face features image of LEGO Star Wars Obi-Wan Kenobi minifigure! Water resistant to 165 ft (50m). Facts about "2851191 LEGO Star Wars Obi-Wan Kenobi Watch"
ShopDescription The Force is with your watch! The Force is with your watch! stant to 165 ft (50m). This page was last edited on 9 January 2016, at 06:40.